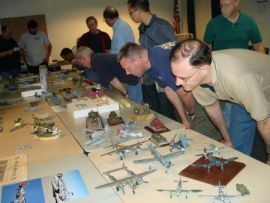 The Silicon Valley Scale Modelers meets every third Friday of the month, from 7:00PM to 10:00PM. People often start congregating around 6:30 to chat and view the models the people have brought. The next meeting is Friday, May 17th. IPMS/Fremont Hornets, Fremont. Meets the second Friday of each month at 7:30 PM at the Irvington Community Center in Fremont. The full address is 41885 Blacow Rd. Fremont, CA 94538. IPMS Santa Rosa, Santa Rosa. Meets the second Friday of each month at 7:00 PM at the Fundemonium in Petaluma (check out their website before attending in case something has changed). The full address is 171 North McDowell Blvd. Petaluma, CA 94954. IPMS Solano County Scale Modelers, Vacaville. Meets every first Thursday of the month at 6pm at Michael’s Craft Store at the Nut Tree in Vacaville, CA.